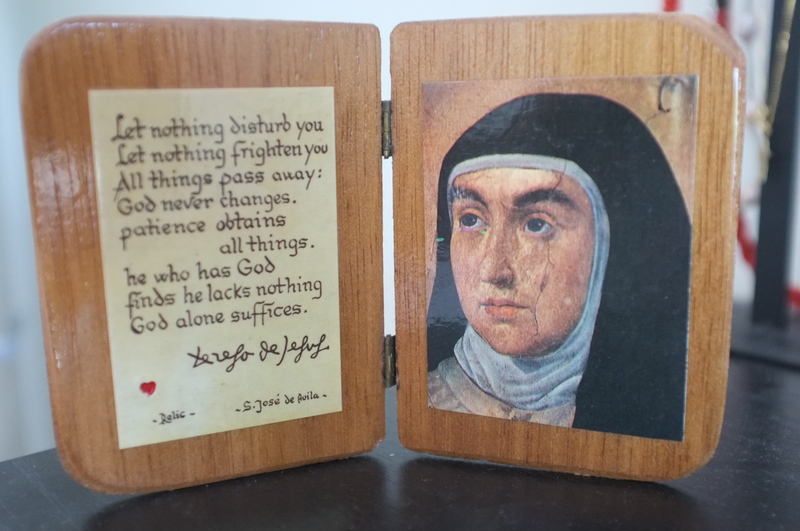 I’ve been following lately an excellent book study on the Interior Castle by St Teresa of Avila run by author Connie Rossini on her blog Contemplative Homeschool. I highly recommend this Doctor of the Church’s teachings on prayer and the nature of spiritual growth. Like with our physical growth we each mature at a different rate. And as none of us grew to physical maturity in a smooth, linear fashion, so it is with spiritual growth. As a mother I need to be mindful of my children’s spiritual growth as well as their physical, academic, and emotional growth. It includes teaching them prayers and things about the Church but is about so much more than that. It’s essentially about helping to prepare the ground for God to work in their souls, however he chooses to work. But the main thing I get out of reading St Theresa’s book every year or so is the reminder that if I am unable to pinpoint where I am in the spiritual life given the insight I have into my own soul (insight which has great limits), how am I ever going to be able to judge where someone else is situated, when I have absolutely no insight or perhaps a minute amount into his or her soul? As Jesus said, “How can you say to your brother, ‘Let me take the speck out of your eye,’ when you yourself fail to see the plank in your eye?”. I copped some abuse via Facebook the other day, for denouncing the sale of a violent game at a family-oriented store. I was lucky because it was actually very mild by Internet standards, but it was still a sting that smarted and prompted me to be judgemental about the commenter. I briefly wondered what kind of person this was, that he would find his behaviour (both the thing he was defending, and his comment to me) acceptable. Then I quickly realised I was wasting my time. I didn’t know this person, and he didn’t know me, I had no insight into what struggles he might be having or his history. And I hadn’t suffered any great attack anyway, just a quick verbal put-down. That little taste of negativity towards family values renewed my admiration for the people who work every day on the frontlines defending what is decent and right in our society amid great misrepresentation and misunderstanding about their motives and what they are striving for. We are blessed to have many people who advocate and work fulltime for things that build up a culture of life – compassion for refugees, protection of children from explicit harmful material in the media and society at large, support for traditional marriage, for the care of children yet to be born, and challenging systems that don’t support the flourishing of children or the elderly or people with disabilities. For all these things and more they can receive much opposition and perhaps weather daily abuse and even persecution as a part of their everyday life. We all to some extent suffer the consequences of being judged by others. But I was prompted that morning to think of the people who endure being harshly judged whenever they speak or act to defend life in all its forms. In this season of Advent, especially, I applaud them and am so grateful that they are keeping open the spaces for Christ and his spirit of life to enter in our society. Meanwhile, at this stage of my life I think I’m meant to keep largely out of the public fray and focus on creating new spaces for Jesus to enter our family life. Thank you Marc, the same to you and your family.